I will post pictures on Monday. Preheat oven to 350 degrees. Place preserves, water, and mustard in a small saucepan. Cook until ingredients are well blended, about 3-5 minutes. Be sure to stir constantly so mixture doesn't burn. 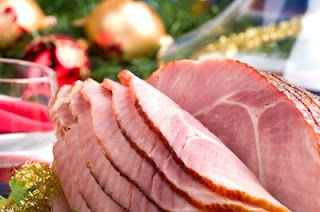 Place ham in oven and allow to cook for 8-10 minutes. Slather ham with apricot glaze. Bake for and additional 8 minutes, coating ham with glaze 3-4 more times.